As we celebrate the 10th Annual Sandstone Ice Festival, organizers thought it would be nice to look back and share a few of the milestones of the Festival that have helped to make the event what it is today. climbers approached the city of Sandstone, Minnesota to discuss the possibility of establishing a local ice climbing festival in Robinson Park Quarry. 2006 First ever Frozen Kettle Chili Cook-off, a tradition is born. It all started with a couple of climbers wanting to share a warm meal. The Chili Cook-off has become an annual Ice Festival tradition. 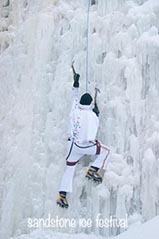 2007 Ice Climbing Elvis makes a surprise visit to the Festival. 2009 Professional ice climber Dawn Glanc visits the festival and gives a slideshow to a packed crowd of winter sports lovers. 2010 The Sandstone Ice Festival gets a shout-out from the National Geographic Explorer Magazine. 2011 First year of the Robinson Quarry Ice Park. Organized by the Minnesota Climbers Association and supported by the city of Sandstone, city water lines are extended to create Minnesota’s first Ice Park. 2012 Ice Park expanded to add Class II ice providing access to beginner climbers. The Sandstone Ice Festival is featured on WCCO’s Finding Minnesota. 2013 Sandstone Ice Festival partners with Hard Water Sports to continue to grow and promote the event. 2014 Sandstone Ice Festival celebrates ten years of Iciness. 2015 and beyond, the organizers of the Sandstone Ice Festival hope to continue the tradition of providing a venue for safe climbing, to continue to promote active lifestyles and encourage green tourism to the area. With the combined efforts of the many volunteers and the support of the city of Sandstone, Minnesota – we are sure to have many more festivals. A special thanks goes out to Hard Water Sports and the MCA for the support they have given to the Sandstone Ice Festival.